Happy Easter, readers! On this Easter Sunday, I bring you a look at Here Comes Peter Cottontail, a movie that signifies childhood for many of us. The movie was originally made for television in 1971, but its re-release on VHS in 1990 made it such a huge hit that that many of us who grew up in the era of VHS tapes remember this movie with great fondness. Featuring the voices of Danny Kaye, Vincent Price, and Casey Kasem, the movie is a family-friendly story told by eccentric narrator Seymour S. Sassafrass (Danny Kaye) about Peter Cottontail, a young bunny in egg-producing April Valley who is about to be named Chief Easter Bunny and supervise all the egg-making that happens there. But his plans are foiled by evil Iron Tail (Vincent Price), who wants to name himself Chief Easter Bunny and ruin Easter, as revenge for his tail being run over by a child and replaced with a ball of iron. As the constitution of April Valley states that whoever delivers the most eggs on Easter morning gets to be Chief Easter Bunny, Iron Tail proposes a contest…and wins. But with the help of Seymour S. Sassafrass and his time machine, along with a few friends he meets along the way, Peter is able to travel back in time and change the outcome of the contest. Though created as a children’s movie, Here Comes Peter Cottontail has some wonderful things for adults to look out for as well. Those familiar with the personas of Danny Kaye and Vincent Price will notice that Seymour S. Sassafrass displays many of Danny Kaye’s unmistakable features–including his prominent nose and red hair. Vincent Price is the perfect Iron Tail, with his background in macabre pictures and villainous voice. In addition, the film is a wonderful example of production company Rankin/Bass’ signature stop-motion animation. “Animagic,” as the company called it, was put to use in several Rankin/Bass productions including Willy McBean and His Magic Machine (1965) and Rudolph the Red Nosed Reindeer (1964), and this technique has become synonymous with the company. The animation was nearly all created by pioneer Japanese animator Tadahito Moshinaga, whose MOM Studio in Japan partnered with Rankin/Bass to create animation for the stories written by the studio. Moshinaga has become a legend in Japanese animation circles, and Moshinaga and Rankin/Bass collaborated on over 130 titles. Tadahito Mochinaga at work on WILLY MCBEAN AND HIS MAGIC MACHINE (1965). Here Comes Peter Cottontail is a testament to how great films are able to achieve a renaissance because of home viewing media. In addition to its reissue in 1990, it has seen several DVD releases and the entire movie has been uploaded to YouTube. I am embedding it here, so that you and any children in your life may watch this fun movie right here on the site. Happy Easter! See you next time! 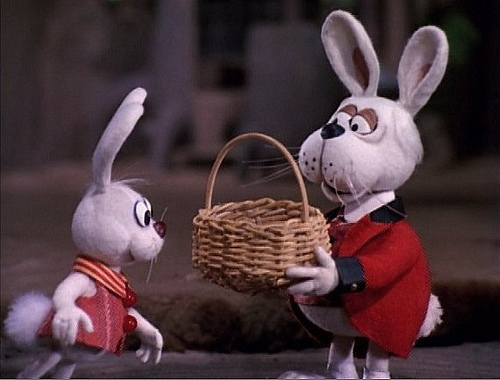 This entry was posted in Lara Gabrielle Fowler and tagged 1971, animation, danny kaye, easter, here comes peter cottontail, movie, television, vincent price. Bookmark the permalink.